I came across this item in the Typewriter Topics edition of September 1916 and started looking into the life of Nina Larrey Smith Duryea (1869-1951). Hers is a fascinating story, yet again one that has been utterly neglected by the like of Wikipedia. 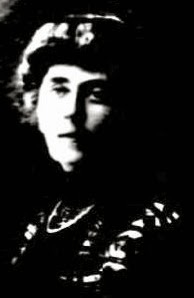 Soon after the outbreak of World War I, on July 28, 1914, American woman Nina Larrey Smith Duryea found herself alarmingly close to the advancing German army, as she was spending her ninth summer at Dinard, a commune in the Ille-et-Vilaine department on the Côte d'Émeraude of Brittany, near Saint-Malo in north-western France. 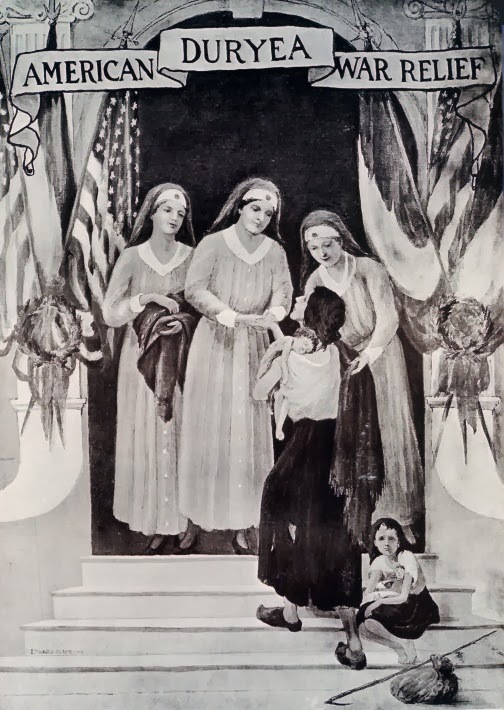 Duryea's work begun with the arrival of those first Belgium refugees, who were soon followed by many more people from northern France, forced from their homes and arriving in Dinard without food, clothing or hope. Later, as the work of Duryea's group become systematised, and received the official recognition of the French government, its headquarters were moved to Paris and were established at 11 Rue Louis le Grand, in rooms lent by the Vicomte de Saint-Seine. In New York, the American office became a clearing house for the 69 units taking part throughout the US. 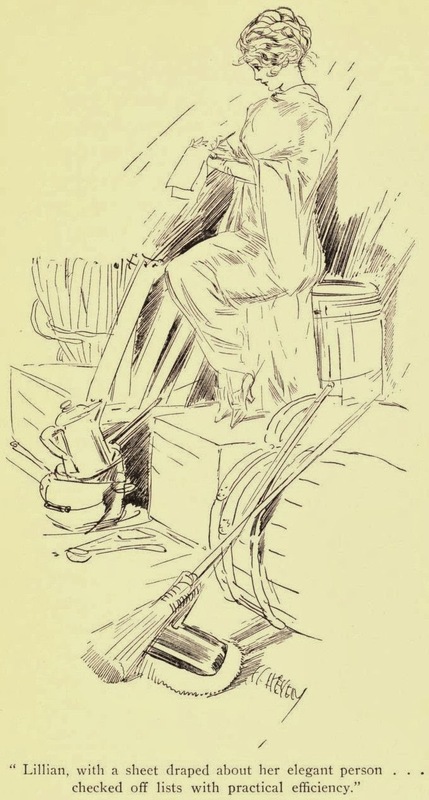 Duryea is seen pouring herself a cup of tea. The Secours Duryea did work for refugees, for the "réformés" or demobilised wounded, and for destitute French women and children. 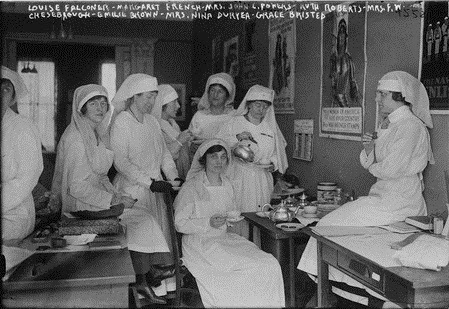 While co-operating with the Red Cross, it remained independent for two reasons: because the French government transported its relief items directly and quickly from New York to Paris free, and because its work was distinctly for the individual. 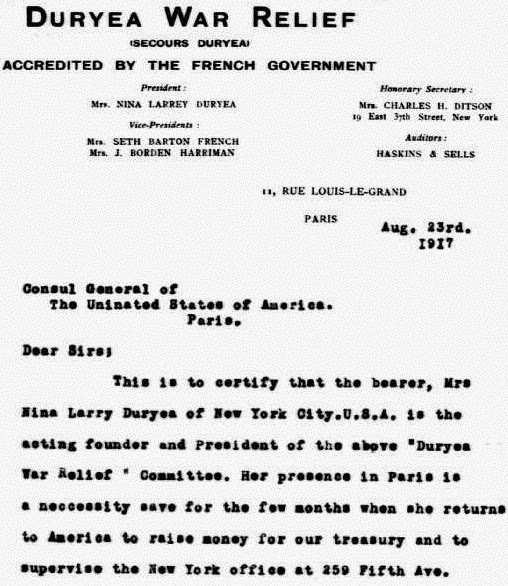 Up to February, 1915, Duryea distributed more than 40,000 articles in the north-west of France, and during the next two years proportionately the same amount was distributed direct through the Clearing House, the Secours National, the Oeuvre des Belges, the Comité des Refugiés du Nord and through the Queen of the Belgians. Distributions were made, also, to the Dardanelles, Serbia and Poland. In the summer of 1917 the French government assigned to the Duryea War Relief 17 ruined villages in the canton of Roye (Somme) to aid. Here members of the staff lived amid the ruins, and distributed to the inhabitants clothing, tools, household utensils, seeds, food, bedding and clothing. Motor tractor ploughs were sent to sections bereft of man power. Milk was sent to those, especially, wounded soldiers, suffering from tuberculosis, to hospitals, and to babies. Hospitals were also provided with bedding and surgical dressings. 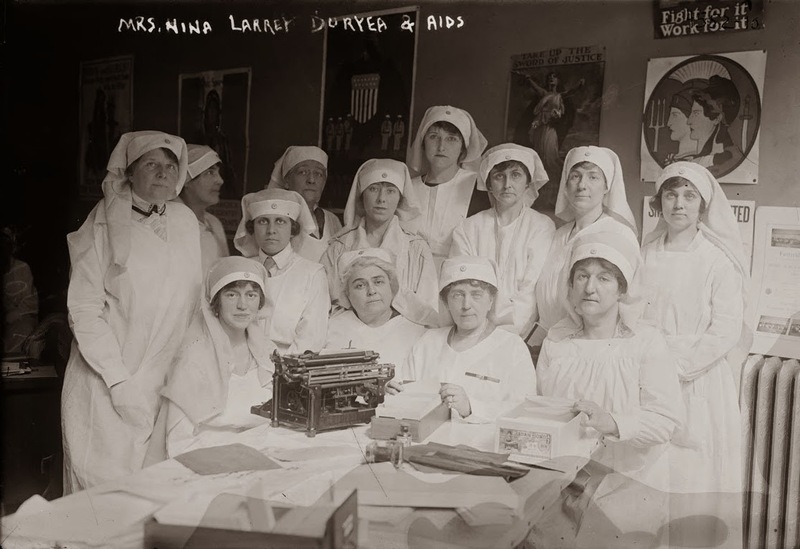 Layettes were provided for destitute mothers, usually from those parts of Belgium or France occupied by the Germans. Comfort packages were sent to soldiers and to prisoners in Germany. Special aid was given the réformés, to assist them to a means of earning a living, and to the refugees who arrived in Paris, often without clothing or household supplies. Thirteen days after the armistice on November 11, 1918, Duryea was the first civilian to cross the battlefields of the Ardennes and the Argonne, with French motor trucks loaded with supplies. 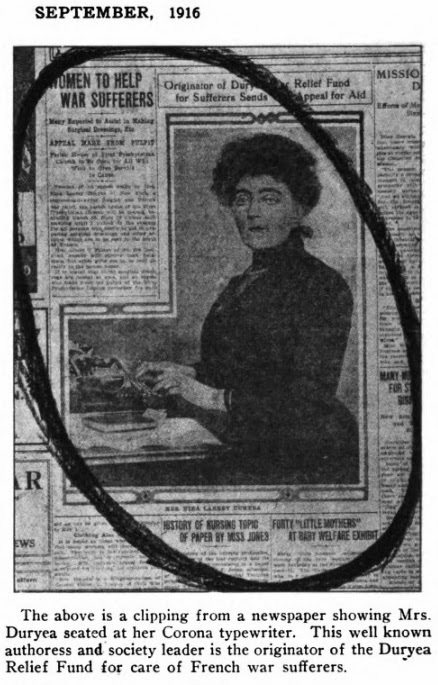 In January, 1919, she returned to America to impress upon the US the need of continued relief in France during the period of reconstruction. 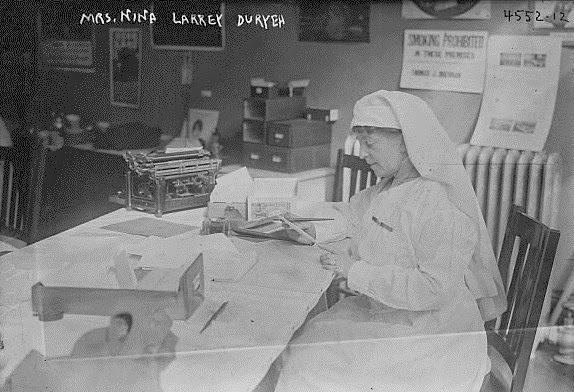 She reported that the Secours Duryea had during the war clothed more than 150,000 war victims and had fed and sheltered many others. 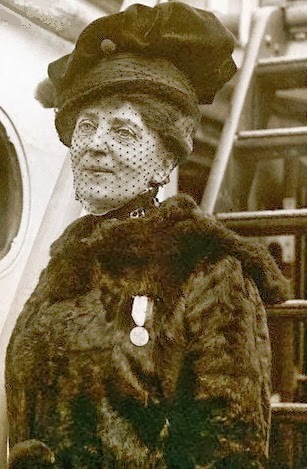 For her work Duryea received from France the Legion of Honour and the gold medal of honour; from Belgium the Queen Elizabeth Medal; from Montenegro the Military Medal; from Russia the Order of St Catherine; and from the National Institute of Social Sciences, of which she is a member, the Liberty Service Medal. And yet, until now, there was almost nothing about her on the Internet! Nina Duryea was the daughter of Franklin Waldo and Laura (Bevan) Smith. She was born in Cohasset, Massachusetts, on August 11, 1869 (but always claimed to have been born in Boston). She was a descendant of Urian Oakes, the second president of Harvard College. Her childhood was spent in Boston, where she was educated. She later finished her education in Brussels, Belgium, and was presented in society in London under the auspices of the niece of the Duke of Norfolk. In 1887 Nina married at Trinity Chapel, New York, Chester Burrell Duryea, the son of Brigadier-General Hiram Duryea of the Duryea Zouaves. 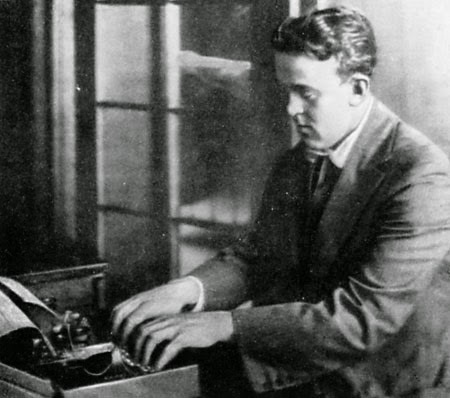 Nina became a successful author, writing Tales of St Augustine (1891), Among the Palms (1903), The House of the Seven Gabblers (1910), The Voice Unheard (1913), A Sentimental Dragon (1914), The Soul of Fighting France (1918), Mallorca the Magnificent (1927) and The Pride of Maura (1932). 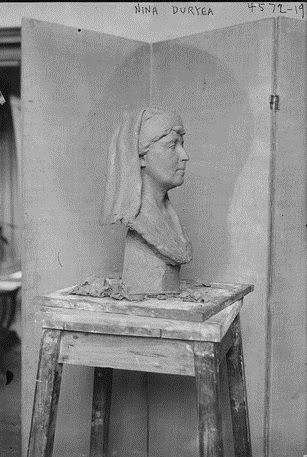 Nina Duryea died at Great Barrington, Massachusetts, on November 3, 1951, aged 82. 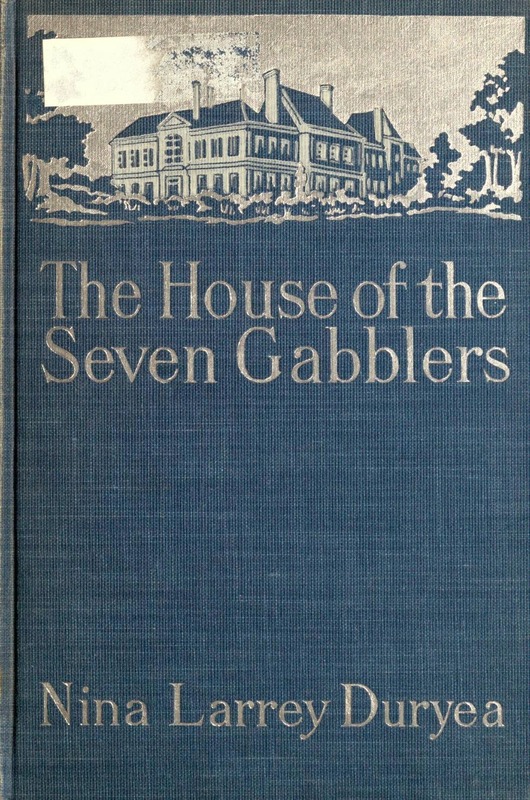 Her house on Yale Hill was bought for $8500 in July 1952 by Tony-nominated actress Eleanor Wilson, a noted contributor to the Berkshire Playhouse in Stockbridge, Massachusetts. A native of Chester, Pennsylvania, Wilson was one of the first actresses to perform for troops during World War II. She was the landlady in Alice's Restaurant (1969) and played the mother of Warren Beatty's character John Reed in the 1981 film Reds. 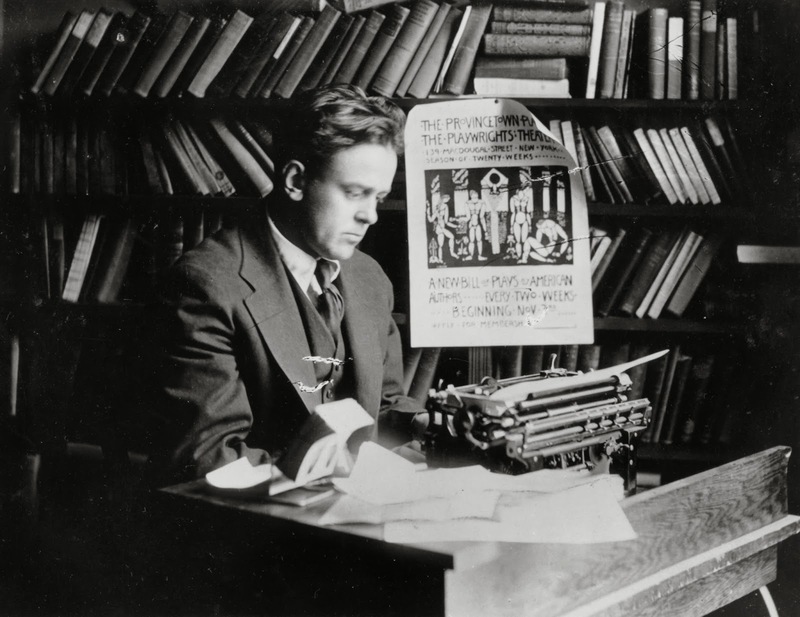 Above and below, John Reed, who was played by Warren Beatty in Reds, in which Mrs Reed was played by Eleanor Wilson, who bought Nina Duryea's house. 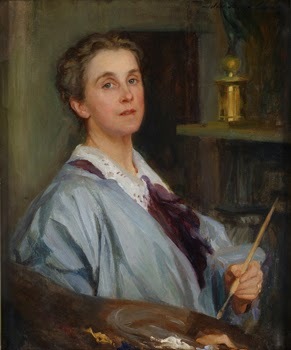 Among Duryea's group was the artist Lydia Field Emmet (1866-1952), self-portrait above, whose portrait of Lou Henry Hoover, wife of former West Australian mining engineer, President Herbert Hoover, is the official White House portrait. Duryea's Zouaves were two New York regiments of volunteer Civil War soldiers. 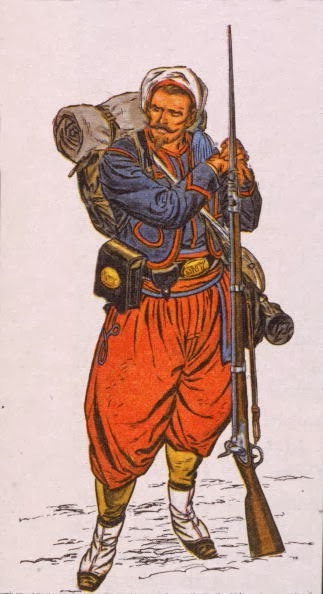 Zouaves were soldiers who wore unusual uniforms, imitating French and Turkish designs of the late 1700s and early 1800s. Duryea's Zouaves were distinguished by dark blue jackets and vests with red trim, red sashes with light blue trim, and baggy red pants. I am an avid collector of books about the history of Mallorca having visited this beautiful island every year since 1968. I have just started reading "Mallorca the Magnificant" and I am in raptures about the author's words and prose. Just a lovely and informative read. I cannot commend it more highly. I am a relative of her ex-husband, Chester Duryea. Chester and Nina had one child together, Chester, jr. Nina and Chester divorced. Chester murdered his father and spent most of his life in an insane asylum. However, he paid alimony to Nina for her entire life. It's inspiring to see all the good Nina did in her life despite the tragedy she had to endure. I am a research in Portland, OR USA, researching American women who served in volunteer capacities overseas during World War 1. 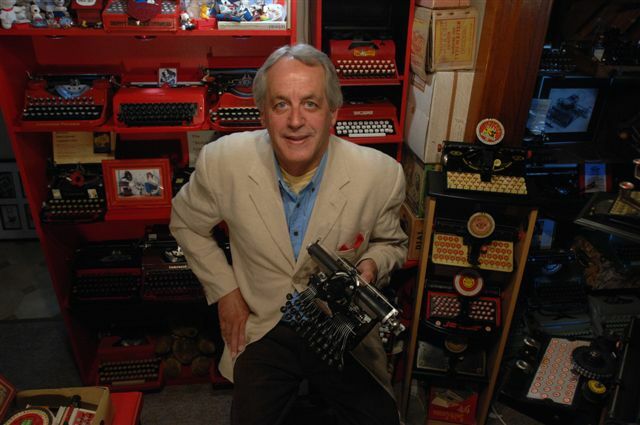 You blog Is "pay dirt"! Thank you for telling the story of Nina Duryea. She will be one of the characters in the play I am assembling, and any other efforts to follow. I am SO GRATEFUL to have this information and will credit you appropriately as I use it. If you feel so inclined, please contact me. My email is ww1revues@gmail.com. Thank you again for you article on Nina Duryea For a couple of months, the research has been quite desert-like. Last week, I broke through and an THRILLED to be finding these amazing women! Thank you again for you article on Nina Duryea For a couple of months, the research has been quite desert-like. Last week, I broke through and an THRILLED to be finding these amazing women! My personal email popped up below. Either is fine.